When you gotta go, you gotta go. And the good news is, when you gotta go at Memorial Union, there are plenty of restrooms to choose from. Thirteen to be exact,and more are coming in fall 2017. Plus, we don’t like to brag (Who are we kidding? Yes, we do! ), The Badger Herald recently rated Memorial Union’s new first floor lavatories 5/5 for perfect ventilation, two-ply tissue paper, strong cell service, and more. Yes, there’s even more to love about the quality and comfort of our washrooms. This isn’t the first time The Badger Herald team has taken time to appreciate our restroom retreats. In February 2016, the student newspaper heralded the Memorial Union’s restrooms as “two-ply paradise”. Not long after, another Herald powder room reviewer called our art-filled restroom in Memorial Union’s lower level “Eden”. Now, quality is important, but, when it comes to comfy commodes, more is definitely better. 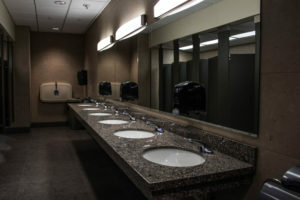 The reopening of the central and east portions of Memorial Union’s first floor meant the unveiling of four restrooms, including two men’s and two women’s. The Badger Herald didn’t call these new washrooms “heaven” for nothing; they have push buttons, accessible stalls, changing tables, a modern design and more. You’re probably wondering where these new campus oases are. One set of women’s and men’s rooms are right across from dessert dreamland Daily Scoop and caffeine and pastry paradise Peet’s Coffee & Tea. The other set isn’t far away. Those women’s and men’s restrooms are right outside of Gekas Commons (formerly known as the Trophy Room). 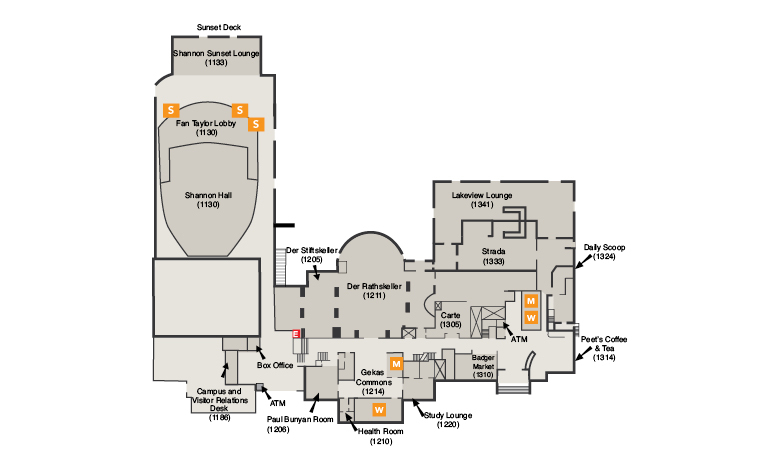 Click here to see a map of all Memorial Union floors. Now that you know where the best restrooms in town are, what are you waiting for? Come down and experience our lovely lavatories for yourself.